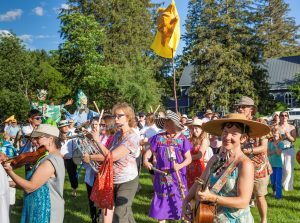 The Summer Revels kicks off the summer season with a fun, family-friendly performance in a festival atmosphere. Food, crafts, and activities will be available before and during the performance, or bring your own picnic supper to enjoy under summer skies! This years’ Summer Revels performance takes us across the U.S.A. on a family vacation! New arrangements of old familiar songs, from Appalachia to honky-tonk, New England to New Mexico. A little bit country, a little bit rock-n-roll, a little bit madcap, and a lot of fun. Posted On 5th February 2019 ~ Comments Off on “Venus Rising”, World Premiere, through Feb 17, Northern Stage, White River Jct.